"There were some very basic ways that we could have kept track of the children and parents," said Sen. Richard Durbin. WASHINGTON — Top officials from key government agencies told a Senate committee Tuesday that they first learned of the Trump administration's "zero tolerance" policy, which led to the separation of migrant children from their parents, when the Attorney General announced the policy publicly in April. 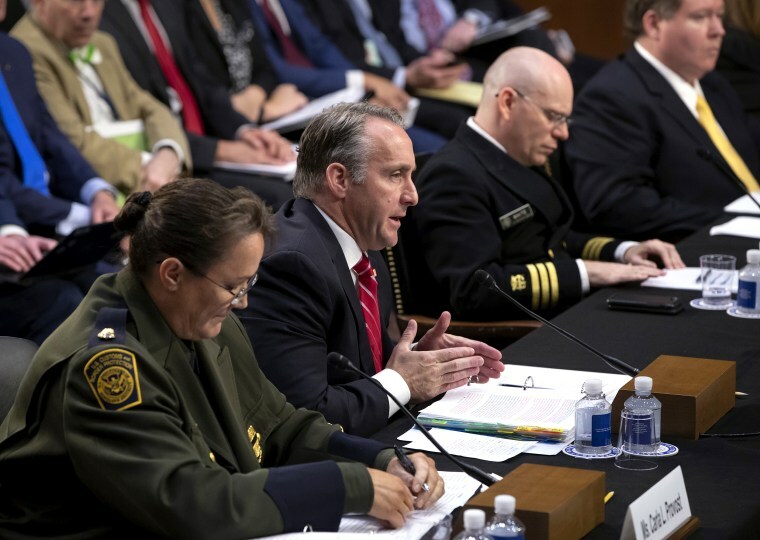 Democratic Sen. Sheldon Whitehouse asked Acting Border Patrol Chief Carla Provost, U.S. Immigration and Customs Enforcement official Matthew Albence, Health and Human Services official Jonathan White, Justice Department official James McHenry and U.S. Citizenship and Immigration Services official Jennifer Higgins when they each learned of the zero tolerance policy and its implications for migrant families. Each said they found out on or about April 6, the day Attorney General Jeff Sessions made a speech declaring the Trump administration would now start prosecuting every immigrant crossing the U.S.-Mexico border illegally, including those with children. White, who transferred to another position on March 15, said he was told up until his last day that family separation was "not the policy of the United States." Sen. Richard Durbin, D.-Ill., blamed the lack of planning for the difficulty in reunifying families. As of Friday, the government had still not reunified 650 children with their parents, the majority of whom have been deported and have yet to be tracked down by the U.S. government. "It's hard to imagine, isn't it? The United States of America says, 'We're going to start separating kids forcibly from their parents. We're not going to set up a system of tracking those kids so we can find them or match them back up with their parents. We're just going to separate them,'" Durbin said. "There were some very basic ways that we could have kept track of the children and parents," he added. Albence, speaking on behalf of ICE, said many parents choose to accept deportation from the U.S. without their children because the children stand a much higher chance of gaining asylum status and staying in the U.S. permanently. "So if you were a parent living in a bad spot and you could get your child into the United States, chances are they stay here?" asked Sen. Lindsey Graham, R.-S.C.
Albence said yes, because only about 1.5 to 2 percent of children who enter without parents are ever returned to their home countries. A federal judge has ordered the federal government to hand over all information it has on the parents who have not been reunited with their children so that pro-bono attorneys from the ACLU may provide legal counsel and help the parents determine whether or not to accept deportation without their children.